Location: This traffic signal box is located at the intersection of Milton Road and Croydon Street, Toowong. Completed date: 12 December 2018. 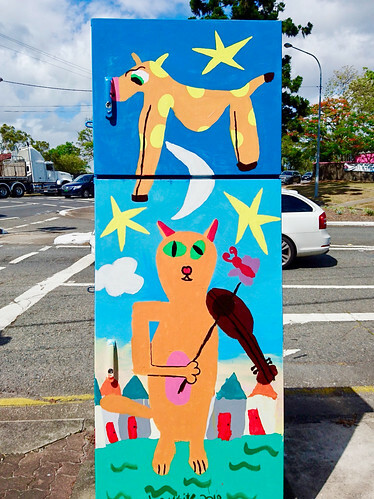 Description (in the word's of the artist): "The artwork, by an eight year old, takes its theme from the nearby Cat and Fiddle shopping centre, and includes a possum wearing a Toowong School uniform, colourful Queenslander houses, and a sunset matching that often seen from Toowong."